The official presentation of the excellent results obtained by the joint Vallarta-Nayarit campaign confirmed the over 130 thousand recuperated airline seats, the 18.4% increase in number of tourists and the $11 million dollar joint budget. 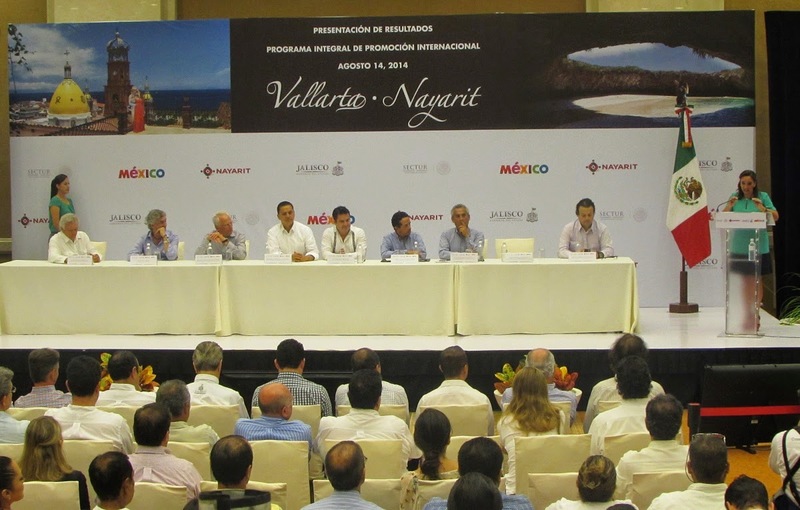 The Federal Tourism Secretary, Claudia Ruiz Massieu, endorsed the validity of the Vallarta-Nayarit joint campaign during the official presentation of the results of the comprehensive international promotion of said effort. This campaign has become a model for other destinations to follow, thus the $11-million-dollar joint budget will once again be made available. Also present at the event were Rodolfo López Negrete, head of the Mexico Tourism Board (MTB); the governors of the states of Jalisco and Nayarit, Aristóteles Sandoval and Roberto Sandoval, respectively; the tourism secretaries for both states as well as representatives from the three levels of government, business owners and the promotion directors from both destinations. Both governors confirmed their commitment to invest $1.6 million dollars per state to continue the joint promotion. They also agreed to continue their collaboration to ensure the safety of citizens and visitors. Claudia Ruis Massieu announced that due to the collaboration between the states and its results, Nayarit and Jalisco are to be included for the first time into the travel industry’s National Infrastructure Program with multi-million dollar budgets. This will cover projects such as the new cruise port, the rehabilitation and construction of highways connecting to the coast and the investment in more infrastructures. The VP of Grupo Velas, Juan Vela, who represented the regions’ hotel owners, acknowledged this long-term investment would attract even more investors, which equals more and better jobs for its citizens. The flight capability towards the Vallarta-Nayarit International airport grew 17%, one of the best figures in the entire country with 133 thousand recuperated seats, all thanks to the campaign. 600 thousand international tourists arrived to the region during the first semester of the current year, representing an 18.4% increase over the first semester of the previous year. The Bank of Mexico announced that from January through June of 2014 there was an increase of 17.6% in the influx of foreign currency to the country as compared to the same time period in 2013, representing over $8.4 billion dollars. Click here for a podcast of the meeting: http://we.tl/tHgMItMapg.